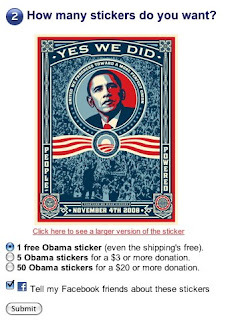 MoveOn.org is giving away free stickers commemorating Barack Obama's November 4 win. Headed "Yes we did," a play on Obama's speech "Yes we can," they're designed by Shepard Fairey, one of my favourite street artists. Tasty, tasty. Would've ordered a print, too, but they're already sold out. Guess I'll have to settle for vacuum-sealing my Nov. 5 copy of the NYT. Neat how there's also an option to let MoveOn shill the stickies on your Facebook page. It was one of those rare instances where I was like, "Yes, marketer, please use me."